This guide explains the architecture of the main C++ code of LinuxMCE. 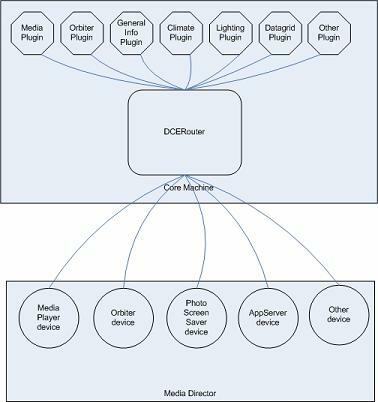 A new tutorial for Developing a DCE Device has just been added to the wiki. While we're creating our own Doxygen documentation, the most recent information regarding architecture and getting started with development can be found on the "Developers Guide" page, and, the Pluto Doxygen is still online. 5 So the DCE Router lets applications communicate, so what? LinuxMCE has been designed as a Linux distribution that orchestrates all the numerous OSS applications that that run on the home PC of the 21st century home. To the end user, LinuxMCE aims to appear to be one single application with a single user interface, hiding the multitude of software it is comprised of. Unlike its predecessor Pluto which is a platform for developing "smart home modules that all work together", LinuxMCE's primary mission is to benefit from the work at Pluto and others, by ensuring 100% compatibility with them. The LinuxMCE team is trying to do something bigger than just an Asterisk distro, or a MythTV distro, etc. : we're combining many applications into an integrated whole. We're doing this the UNIX way, using a messaging protocol over sockets, so that these applications can still be developed independently and added or removed from LinuxMCE as desired by the end user. The functionality in LinuxMCE is provided by a variety of open source projects and it's our mission to make them work together. to control the modern home's entertainment, security, and automation. In 2006, LinuxMCE was forked from Pluto's linux distribution because Pluto was designed as a 'turn it on and press play' appliance, rather than a traditional software application. While LinuxMCE includes hundreds of scripts and utilities from Pluto, it is designed with as a modular system to which many other OSS projects can be integrated. To learn more about Pluto's code, please consult the Doxygen documentation which details all the scripts and utilities that make up the Pluto distribution. LinuxMCE uses a modular architecture made of "devices" that are integrated to the system by interfacing them to the DCERouter. The heart of LinuxMCE, the 'main application' DCERouter is nothing but a general-purpose message router. It has absolutely no code relating to any of LinuxMCE's functionality--it just relays messages between "Devices". The functionality of LinuxMCE is entirely in separate programs (aka "Devices") which all run independently and communicate with each other by passing messages through DCERouter over sockets. There can be hundreds of these "Devices" in a smart home, that do all sorts of things. As shown in the diagram below, many of LinuxMCE's devices are actually "wrappers" we have written for existing open source programs to allow them to work together seamlessly in a LinuxMCE system. An example of this is the wrapper written for Asterisk: it sends event messages to the DCERouter whenever a phone call comes in, and, receives command messages when it is time to place a call. How the wrapper communicates with the open source program depends on that project. In the case of Asterisk, the wrapper communicates with Asterisk over a socket. It acts as a translator, converting messages from its socket connection with the DCERouter into messages from its socket connection with Asterisk. The wrapper for the Xine media player links in Xine's own library, and calls Xine functions directly, while for MythTV, the wrapper communicates via a special telnet interface. Each project's wrapper is written to meet its needs. Some devices are not implemented as separate binaries, but as plug-ins that run as dynamic libraries in DCERouter’s memory space. Since there are literally thousands of home automation components and pieces of A/V equipment that require controlling with serial port, USB, or Ethernet, LinuxMCE has been designed with GSD support to enable communication with these various technologies. GSD is a fast protocol which is simple to use, yet flexible enough to be used to support lighting control systems, climate and pool systems, cameras, or external devices such as IR blasters, and much more. MakeRelease, which builds packages for a given operating system. ConfirmDependencies, which installs packages for a given operating system. They both pull their software and dependencies from the same database. You can go to advanced > software > packages to find the list of packages, including those for the Pluto manufacturer which is the data we use to figure out what to install when and where. So the DCE Router lets applications communicate, so what? Imagine you set up a LinuxMCE system in your living room and want the lights to dim when you start watching a movie. If you were using a regular Linux distribution without the DCERouter, you would need to write a launch script for Xine that tells MisterHouse to dim the lights on entry and restore them on exit. If you wanted this to be delayed so that when you exit one movie and enter another shortly thereafter the lights don't dim, the script would become rather complicated. You would need to adapt the script for watching TV in MythTV and any other media application you wanted to use. With Linux MCE, you just listen for the the start and stop DCE events in a small module, and send out DCE events for the light control. For this one task, you can still just write a script. But you might also want to notify yourself of a call and pause the media player based on who is calling. You can do this with Asterisk and MythTV without a DCERouter, but you need to learn about how Asterisk handles events and MythTV handled OSD notifications; and, you need to write a notifier for Xine because it doesn't have built in notifications. With LinuxMCE you only have to learn a single interface, DCE, and you simply intercept the DCE message sent from Asterisk, then send a DCE message out to the Orbiter UI, and send out a pause DCE message to all media players. This means that these tasks can all be handled with just some knowledge of the DCE rather than learning a bunch of protocols and APIs. The "Devices" handle the translation of DCE messages for all the applications involved, for the various APIs, and the remote control protocols. Ordinary users that have no programming knowledge can just hook up events using a tool provided by Pluto, but the good news for programmers is that they don't need domain knowledge of all the different applications they wish to integrate. All that is needed is a basic knowledge of DCE messages, and optionally, the Orbiter overlay UI. DCE does what DBUS and many other protocols were supposed to do, but in contrast, it works. With the wrappers that we inherited from Pluto for various applications, applications don't need to commit to DCE or DBUS or any other protocol for LinuxMCE to communicate with them. DCE messages work today. Why should I use the LinuxMCE platform for my project? This page was last modified on 25 October 2012, at 16:17.